A wood-burning fireplace insert is very similar to a wood stove. Older masonry fireplaces preserve charm and beauty but lack efficiency. There is a way to maintain the beauty and charm of your masonry fireplace while increasing its heating capabilities. Installing a wood burning fireplace insert is the answer. 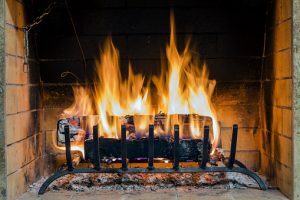 The original fireplace in your home is likely sucking out much of the warm air in the room and venting it outside. The very nature of a fireplace is to add warmth to your space, not take it away. A wood burning insert in Pittsburgh provides greater heating efficiency, greater burning capacity, and reduced air exchange. For these reasons, installing a wood-burning fireplace insert is a wise choice to continue enjoying the crackling and aroma wood burning provides. A winter in Pittsburgh if often cruel and demands attention. You will rely on your fireplace frequently but you must properly equip it. An inefficient and polluting fireplace will be converted into an effective heating system. The insert consists of a firebox surrounded by a steel shell. The outer shell prevents air from escaping through the masonry, but instead, is delivered to your space. The warm air goes where it is supposed to go, and nowhere else. Controlling the environment where the wood logs are burned is important to ensure the combustion rate. If there is too much air flowing through this environment the logs will burn too quickly. Your wood pile will deplete at a much faster rate while increasing your fuel expense. Not to mention the increased effort needed to replenish said pile. The idea is to spend less time outside in the cold. Closing the damper when the fireplace is not in use is the common sense solution to prevent warm air from escaping and cold air entering. This line of defense helps, but is far from efficient. A typical damper lacks an adequate seal to actually prevent this air exchange. With a wood-fireplace insert, the glass doors installed on the insert creates an airtight seal that prevents this air exchange. Can you say yearlong window crack? The glass doors also provide a sure fire way to prevent toxic fumes from entering the home due to an improperly lit fire. Carbon monoxide is not uncommonly emitted from a fireplace; the outside seal will thwart this invader. Winters in Pittsburgh beg for supplemental heating sources. It is of no use if your heat, and heating costs, go up with the smoke. Ed’s woodshed can quickly service your wood burning insert in Pittsburgh and transform it into an effective, cost-saving, and beautiful source of heat for you and your family. Call today, (412) 257-0492, to consult with one of our experts to evaluate your chimney system for its potential to undergo this remarkable transformation.